Drug smugglers and people who’ve entered the country illegally regularly travel North from Mexico through the desert of Presidio County. 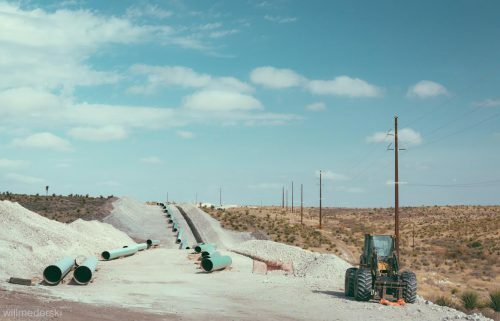 In the last year, that same desert has been the site of a massive construction project: The Trans-Pecos Pipeline, which stretches 148 miles from Presidio to just outside of Fort Stockton. Before construction started, Border Patrol met with pipeline workers to talk about safety and security. They say those meetings paid off, big time. Earlier this year, crews working on the Trans-Pecos Pipeline spotted a red Chevy Avalanche driving on a dirt right-of-way where it shouldn’t have been. They called the Presidio County sheriff’s office, who pulled the car over—officers found bricks of marijuana stacked floor-to-ceiling. In total there was almost a ton. Pipeline workers have been behind a lot of busts lately. That’s what law enforcement was hoping for. Before construction began, Border Patrol trained pipeline workers to spot illegal activity. Turns out, they make good patrollers. Carter says drug smugglers and people who have snuck across the border follow landmarks. They travel along dry creek beds, power lines, railroad tracks—whatever provides a guiding line. And now, the path cleared during pipeline construction. To the point that the Presidio County sheriff’s office says it gets calls from pipeline workers every day. They recently caught three cars full of people who were in the country illegally, thanks to a pipeline tip. But, all those extra “eyes and ears” will soon be gone—the pipeline will be up and running next month. He also warns that it could become a “superhighway” for illegal activity. Because of this new route, Border Patrol will continue to keep close tabs on the area around the pipeline. Only now, without help from the men and women who built it. This entry was posted in KRTS News and tagged Border Patrol, Immigration, Law Enforcement, Presidio County, Trans Pecos Pipeline. Bookmark the permalink.